1. Throughly wash vegetables in brine solution and cut into medium irregular sizes. 2. Blanch cut vegetables. ( You can blanch it by either putting the cut vegetables into boiling water for 2-3 minutes or Pour hot water unto the cut vegetables and let it steep for some few minutes. N/B: blanch carrots separately from the Green pepper since that is firmer than than green pepper thus to have an even blanching. 3. Cook macroni with about 2 table spoons of vegetable oil for 5-7 minutes. N/B:The oil is added to the water to prevent sticking. 4. 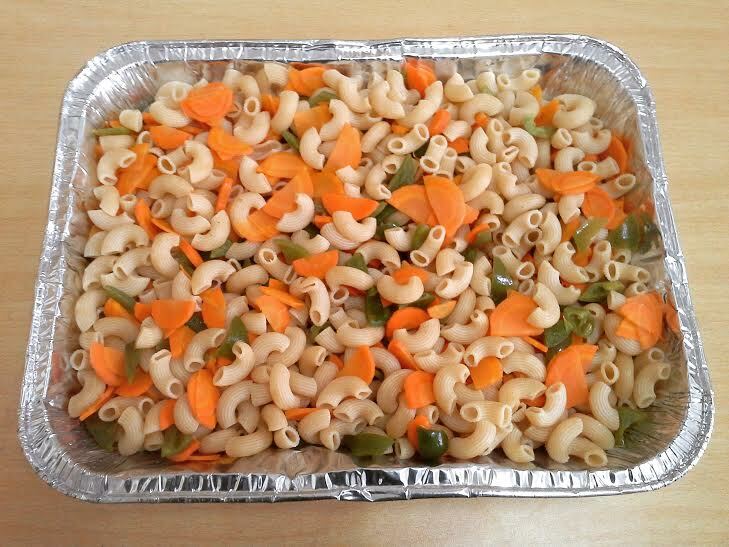 Strain water off the macroni and mix with blanched vegetables. 5. Add a little white pepper, mix and serve as a side dish to any dish of your choice.